Spanish police on Monday shot dead a man they suspect was the Islamist militant who drove a van into a Barcelona crowd last week, killing 13 people. Ending a five-day manhunt, police tracked 22-year-old Younes Abouyaaqoub to a rural area near Barcelona. They said they shot him after he held up what appeared to be an explosives belt. Police gave few immediate details of the incident in Subirats, saying they had called in a bomb squad to approach the man’s body after gunning him down. Abouyaaqoub had been on the run since Thursday evening, after he drove at high speed into throngs of people strolling along Barcelona’s most famous avenue, Las Ramblas, in Spain’s worst militant attack in over a decade. Islamic State claimed responsibility and police believe the attack was planned by a dozen accomplices, including a brother and two first cousins of Moroccan-born Abouyaaqoub. “The suspect wore what appeared to be an explosive belt. He has been shot down,” police said in an official tweet. Local media said the man was spotted by a woman in the early afternoon and then fled through vineyards but police managed to find and shoot him on a road near a sewage treatment plant. The scene unfolded about 40 km (25 miles) from the spot, close to the FC Barcelona soccer stadium on the outskirts of the city, where police said Abouyaaqoub had abandoned a car he had commandeered during his escape. Police said Abouyaaqoub first fled Las Ramblas on foot amid the chaos of the attack, then hijacked the car, stabbing the driver, 34-year-old Pau Perez, to death before crashing through a police checkpoint. Abouyaaqoub had been the only one of 12 accomplices still at large. His mother, Hannou Ghanimi, had appealed for him to surrender, saying she would rather see him in prison than end up dead. Four people have been arrested so far in connection with the attacks: three Moroccans and a citizen of Spain’s North African enclave of Melilla. They are currently being taken to the high court in Madrid, which has jurisdiction over terrorism matters. 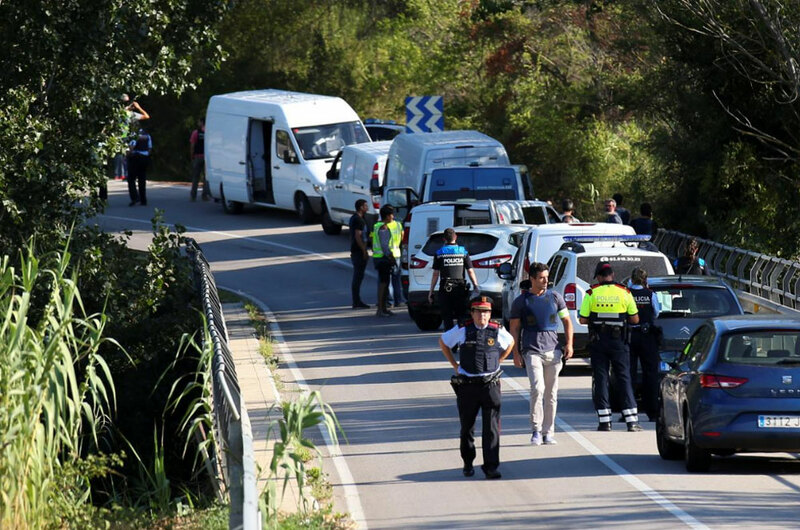 Islamic State also claimed responsibility for a separate deadly assault which erupted hours after the van attack in the coastal resort town of Cambrils, south of Barcelona. In Cambrils, a car crashed into passersby and its occupants got out and tried to stab people. Five suspects were shot dead by police, while a Spanish woman died in the attack. In the roughly seven hours of violence that followed the van’s entry into the pedestrian boulevard of Las Ramblas on Thursday afternoon, attackers killed 15 people: 13 on Las Ramblas, the Cambrils victim and the man in the hijacked car. Of the 120 injured on Las Ramblas, nine remain in a critical condition in hospital. Another two suspected plotters, including an imam thought by police to have helped radicalize his young conspirators, were killed late on Wednesday night, hours before the attacks began, in what is believed to have been an accidental explosion. Police said there was solid evidence to believe that the imam, Abdelbaki Es Satty, was killed in the blast at a house in the town of Alcanar, south of Barcelona. About 120 butane gas cylinders were found there. Police believe the pair was preparing a much larger attack with explosives, but the blast prompted the other militants to adopt a new, less elaborate plan. Abouyaaqoub began showing more religiously conservative behavior within the past year, according to family members in his native Morocco. He refused to shake hands with women during a visit to his birthplace in March, they said. Abouyaaqoub’s brother El Houssaine and first cousins Mohamed and Omar Hychami were among those killed by police in Cambrils. They were all originally from the small Moroccan town of Mrirt. Spanish police shoot dead suspected Barcelona attacker Ending a five-day manhunt the Islamist militant who drove a van into a Barcelona crowd killing 13.